Felt makes a superior fabric for a cowboy hat because it is light, smooth, much harder to tear than other fabrics, and is naturally water resistant. 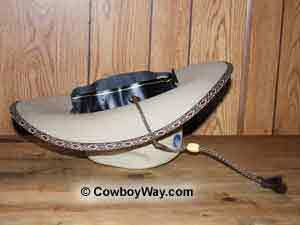 Below are some tips to help you keep your felt cowboy hat looking and wearing its best. Don't set your felt cowboy hat down on its brim. Setting your hat down on its brim could cause the brim to flatten and lose its shape. Instead of setting your hat down on its brim, turn it upside-down and set it down on the top of its crown. 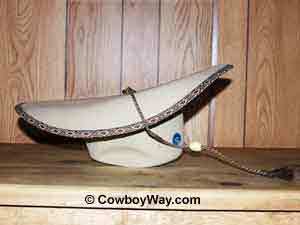 Put your hat up at night by placing it on a hat rack or in a cowboy hat box. Don't take your hat on and off your head by handling the crown. Use the front and/or back of the brim instead. To help your brim hold its shape, handle the brim as close to the crown as you can. Too much heat might be damaging to your hat, so don't leave it anywhere it can get too hot like in an enclosed vehicle or near a heater or stove. 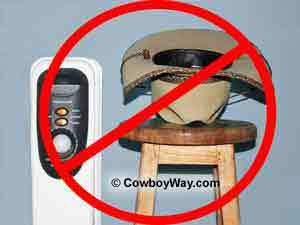 Heat combined with humidity can be especially bad for your felt cowboy hat. When cleaning your hat, dust it off with a hat brush, a sponge, or a clean damp cloth when the hat is dry, not wet. Begin dusting on the front left side of your hat and work your way around the hat in a counterclockwise direction. Persistent lint or stray hairs can be removed by patting your hat with the sticky side of masking (or similar) tape. If you have removed your hat when either the sweatband or the entire hat was damp or wet (from sweat, rain, snow, or whatever), turn the sweatband up until dry. This will help allow sweat, water, and/or hair care products to evaporate instead of soaking into your hat. Let a wet sweatband and/or the entire hat air dry naturally. Do not use heat to speed up the drying process. If you're superstitious, do not put your hat on your bed. It won't hurt the hat or the bed, but a hat on a bed is considered to be bad luck. Felt is a dense collection of short, single animal fibers pressed together with hot water and steam so that they interlock. Felt is a fabric, but it is much stronger than woven fabrics because with felt each individual fiber is interlocked with other fibers in several different directions. Woven fabrics, on the other hand, are made from fibers that are first twisted into threads. When the threads are woven together the result is a fabric that can be torn apart in a straight line. Felt does not have this inherent weakness. 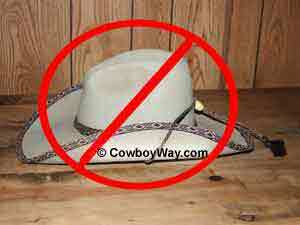 Felt Cowboy Hats - Did You Know? Felt hats are made of wool felt or fur felt. Wool felt hats are usually less expensive than fur felt hats. Fur felt hat are more expensive but provide better rain protection, last longer, and keep their shape better. Fur felt hats are most commonly made from rabbit fur. The more expensive fur felt hats are commonly made of beaver. Other furs are also used to make hats and it is not uncommon to mix different kinds of fur. Xs are the measurement of quality for a felt cowboy hat. The more Xs, the higher the quality. Years ago the number of Xs stood for the amount of beaver used to make a hat (more Xs meant that more beaver fur was used) but this old standard is no longer true. Today, each hat maker uses Xs as a relative rating of quality for their own line of hats, both felt and straw, but there is not an industry wide standard rating system. For example, one hat maker may make a hat they rate as a 3X but this does not indicate that there is or isn't any beaver fur in the hat, and the hat may be of greater or lesser quality than another hat maker's 3X hat.